My aunt is an expert at these, literally she makes them by eye and knows how the consistency needs to be without measuring tools, which I think is awesome. So when I asked her if she can take the time to actually write down the ingredients the next time she were to make them she did just that! God bless her good heart! I am so lucky to have this recipe and share it with you because I think her blinchki (crepes) are perfect! 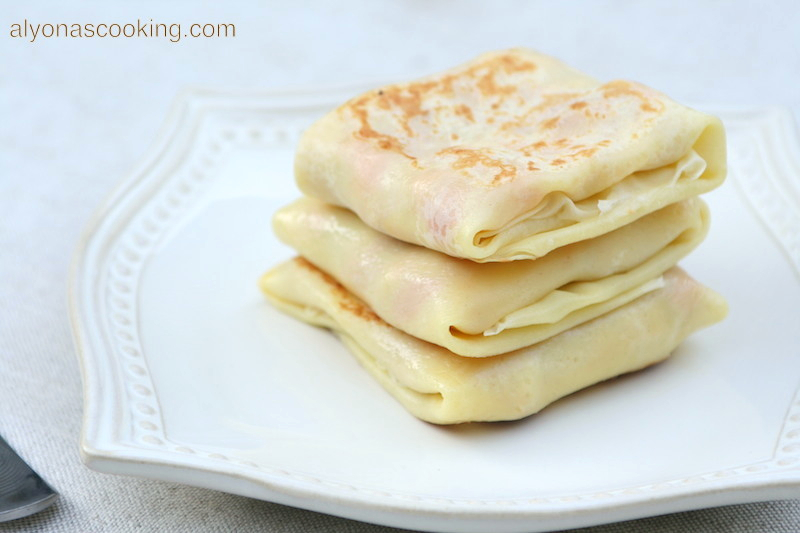 These delicate blini (crepes) get light yellow in color and have the perfect texture as they don’t tear that easily. The cornstarch is the key ingredient for preventing any tears. These crepes hold up very nicely, which is great for fillings like meat or cabbage. I also like that the sweetness is just right to these crepes which makes them very versatile and good for meat and veggie fillings. The key to make these light in color is to cook these over low heat and flip them when the sides start to crisp up slightly, otherwise they can tear during flipping if you attempt to flip them too soon and they can also get light brown if cooked over too high of heat. So temperature and the timing on flipping is very important. Of coarse you can get creative and fill these with whatever you want but I filled these crepes with a chicken mixture. 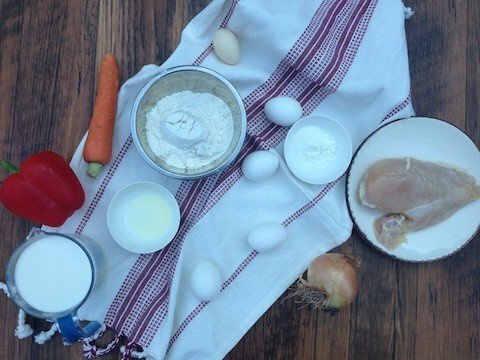 I am so exited to share this recipe with you, so lets begin. 1.) Bring a medium-sized saucepan with water half way full to a boil; add chicken breast. Reduce heat and continue boiling over medium heat for 20 minutes. When chicken has cooked through remove; cool and dice. 2.) TO MAKE BATTER FOR CREPES: place flour into a large bowl. 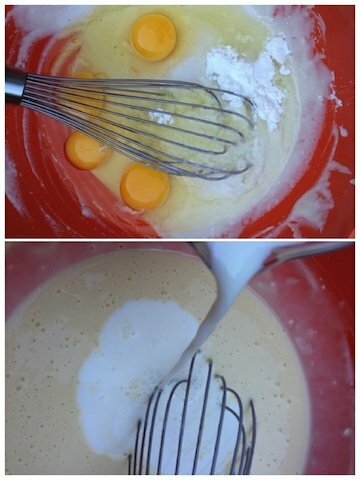 Add HALF of the milk to the flour and whisk until mixture is incorporated. Then add the eggs, cornstarch, salt, sugar and oil to the flour mixture. Whisk all ingredients thoroughly and add the remaining milk. 3.) Heat a medium size non-stick pan (about 9″ in diameter) over low heat. (Mine was set on number two from my stove settings. Do not set on the lowest setting just a tad more from low.) Lightly grease the pan and ladle 1/3 cup of batter to the preheated pan. Make sure your pan is preheated. Quickly swirl the pan from side to side to evenly coat the pan. When sides look like they are slightly crisping, carefully flip over using a spatula. Please keep your eye on each crepe you do not want to walk away from the stove. 4. )Transfer crepes to a large plate and continue working with the rest of the batter stacking on the plate. When crepes are done (I made 14 crepes from this recipe) set aside. 5.) Wash the bell pepper and remove any seeds; finely dice bell pepper & onion. Grate washed and peeled carrot; set aside. 6.) Heat 5 tbsp of oil in a large non-stick skillet over med-high heat. 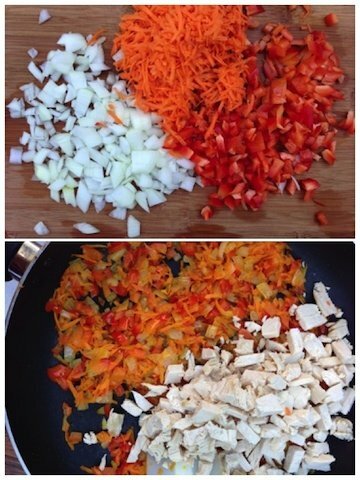 Add bell pepper, onion and grated carrot to the pan and sauté until veggies are tender. Then add the salt, pepper and diced chicken and continue to sauté for another minute or so. Transfer sauté to a medium bowl and allow to cool. TIP: Now there are a few ways you can season the sauté mixture. You can add a raw egg to the cooled sauté mixture (which is what my aunt does and it tastes really good that way) or you can mix 6 tbsp of sour cream with 4 tsp of dill and mix that with the sauté mixture. You can also get creative and add whatever you want. 7.) To fill the crepes spread 1 heaping tbsp of filling in the center of each crepe. 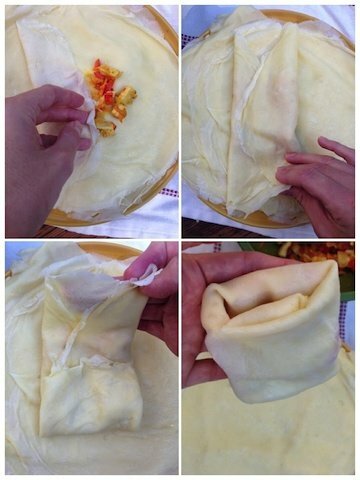 Starting from the sides, fold in each side of the crepe towards the center. Then fold in the top towards the center and the bottom towards the center to form a little pocket. You can eat the crepes after you fold them but I highly recommend frying them over medium heat in some oil to crisp them up. That’s totally optional though, ENJOY! Bring a medium-sized saucepan with water half way full to a boil; add chicken breast. Reduce heat and continue boiling over medium heat for 20 minutes. When chicken has cooked through remove; cool and dice. TO MAKE BATTER FOR CREPES: place flour into a large bowl. Add HALF of the milk to the flour and whisk until mixture is incorporated. Then add the eggs, cornstarch, salt, sugar and oil to the flour mixture. Whisk all ingredients thoroughly and add the remaining milk. Transfer crepes to a large plate and continue working with the rest of the batter stacking on the plate. When crepes are done (I made 14 crepes from this recipe) set aside. Wash the bell pepper and remove any seeds; finely dice bell pepper & onion. Grate washed and peeled carrot; set aside. Heat 5 tbsp of oil in a large non-stick skillet over med-high heat. Add bell pepper, onion and grated carrot to the pan and sauté until veggies are tender. Then add the salt, pepper and diced chicken and continue to sauté for another minute or so. Transfer sauté to a medium bowl and allow to cool. 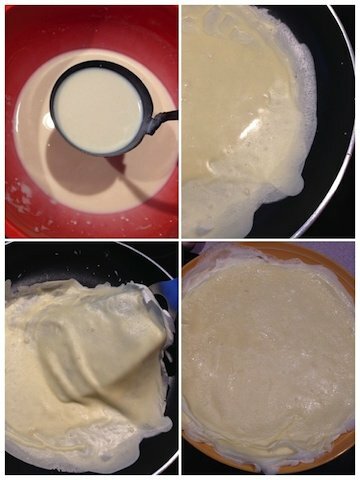 TO FILL THE CREPES: spread 1 heaping tbsp of filling in the center of each crepe. Starting from the sides, fold in each side of the crepe towards the center. Then fold in the top towards the center and the bottom towards the center to form a little pocket. That’s good to hear, Irene! Thank you for trying it out! Made those last week. And let me tell you best crepes and filling. Thank you so much!!! Love your recipes! Made mash potatoes and salad with bacon olivie and everything is so delicious. Thank you for posting yummines. Can wait to try out your different recipes.